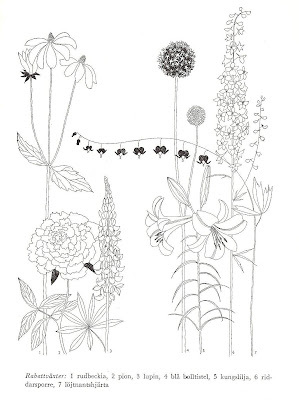 If I would have to choose the most beautiful garden book in my library, Gunnar Martinsson's En bok om trädgårdar (A book about gardens) would be up there as a candidate for the first place. I've always been seduced by the line in art (just think of Japanese or Chinese calligraphy, scroll paintings and old copperplate engravings, and you get the idea), so this book with its simple and graceful but yet powerful illustrations is an absolutely feast for my eyes. 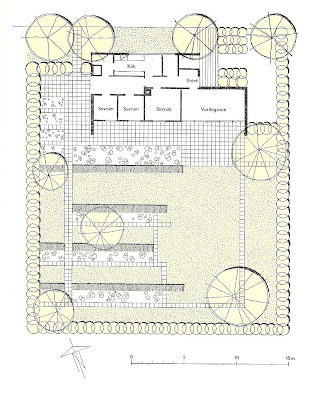 It was first published in in Sweden in 1957, and it is a wonderful testament for some of the finest achievements in modernist garden design of that time in Scandinavia. Gunnar Martinsson was 33 years old when his book came out and had the year before established his own landscape architecture business. During his studies of both landscape architecture and art, and by training at different practices in Sweden, Germany, Switzerland and Italy, Martinsson had absorbed the international modernist thinking of that time. The outcome is well visible in his designs and drawings; they are highly linear, often relying on basic geometric forms, always designed with functionality in focus. His use of materials is discriminating, limited to the minimal and most practical. 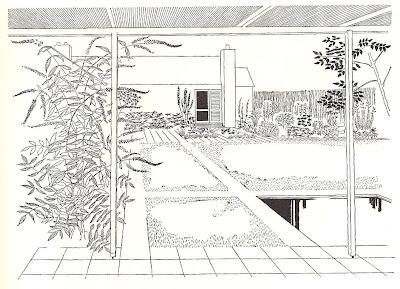 But despite all this, his designs are anything but austere and dreary: their expression is truly modern, completely timeless and highly poetic, mainly because of his skillful use of plants against the clean, simplified structures of the gardens. Martinsson's style comes out very well in his drawings in this book. Of mid-20th century landscape architects, my associations go to Christopher Tunnard, whose article series (and later book, 1938) Gardens in the Modern Landscape had a great influence in the view of landscape architecture, rethinking the modern garden as a social, aesthetic and rational milieu for rest and recreation; and Thomas Dolliver Church, who in Gardens are for people (1955) outlined his four principles for design process as unity (of both house and garden), function, simplicity (both economic and aesthetic), and scale (a pleasant relation of parts to one another). Even if Martinsson was 20 years younger than Church and 10 years younger than Tunnard, they where clearly kindred souls in their principles for design. In Scandinavia and Sweden in special, Martinsson is one of the great landscape designers of the 20th century with an enormous influence on the younger generations. Looking at Chelsea Flower Show gold winner Ulf Nordfjell's designs tells directly that he is a child of the same spirit as Martinsson, combining clean lines and strong forms with sensitive, graceful plantings in the cool, contemporary style of today. As a garden and gardening book, En bok om trädgårdar is very clear and instructive. It advises on choosing the land for the garden and goes through the functions and principles of design to be considered. There are detailed instructions for the choice of materials materials and how to build the various elements of garden, as steps, walls, water features, pergolas and so on. 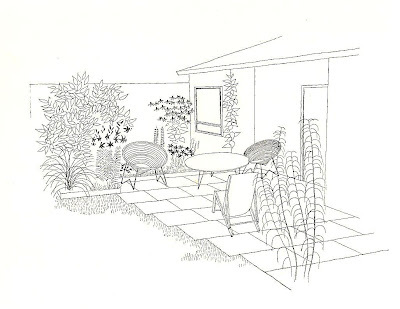 For those who think the modernist gardens consist only of lawns, there is a pleasant surprise: Martinsson includes ten short chapters about plants for different purposes and situations, all illustrated with beautiful, simple but informative drawings, like the one above. In 1955, when En bok om trädgårdar came out, it was chosen as one of the most beautiful books of that year in Sweden. Now, over a half century later, I think this small, black and white book could earn a place as one of the most beautiful garden books of the whole century, despite all the fancy coffee table books that have come out since then. The simple line is sometimes the most powerful tool of all. Gunnar Martinsson: En bok om trädgårdar. Tomtval, idéritningar, trädgårdsdetaljer. Albert Bonniers förlag, Stockholm, 1957. Unfortunately, the scanned pictures above do not show the crisp quality of the drawings in the book. Det var ju bara kul med en länk. Intressant om denne man, Martinsson, inser att jag inte har så mycket koll bakåt - så tack för den introduktionen! Lovely simplicity in illustration and design. Wow, looks amazing! A candidate for translation, with you as the translator, perhaps?! I can see that it could also be fun for kids, to xerox a page for them and let them color in the scene. Simplifying it down to b X w shows the line and clarity of the design so well, as you say. Lovely. Den är en klar favorit hos mig också! Hade kopierat ur den boken tidigare, men fick nyligen tag på den på ett antikvariat. Glädje! Jag har njutit hans teckningar i tidskriften Hem i Sverige från mitten av 1900-talet, där finns mycket inspiration att hämta. Uppskattar din fina och informativa blogg!